The Whittier Bridge, a landmark for travelers on Interstate 95 just south of the New Hampshire line, was built in 1951. Vacation and truck traffic should have an easier time getting to and from New Hampshire and Maine beginning in late 2016, thanks to a three-year, $292 million improvement project for the Whittier Bridge and Interstate 95 . Despite the army of cranes, barges, and earthmovers already at work, leaders in Amesbury, Newburyport, and Salisbury are optimistic about getting through the construction unscathed. “I would say that overall it’s gone pretty well, having a major, major construction project right through the middle of our communities,” said Amesbury Mayor Thatcher W. Kezer III. “Communications-wise, we’ve had some bumps in the road, but the bridge project crew and MassDOT have worked really hard’’ to resolve them, he said. “There are no impacts at this point,” said Salisbury Town Manager Neil Harrington. 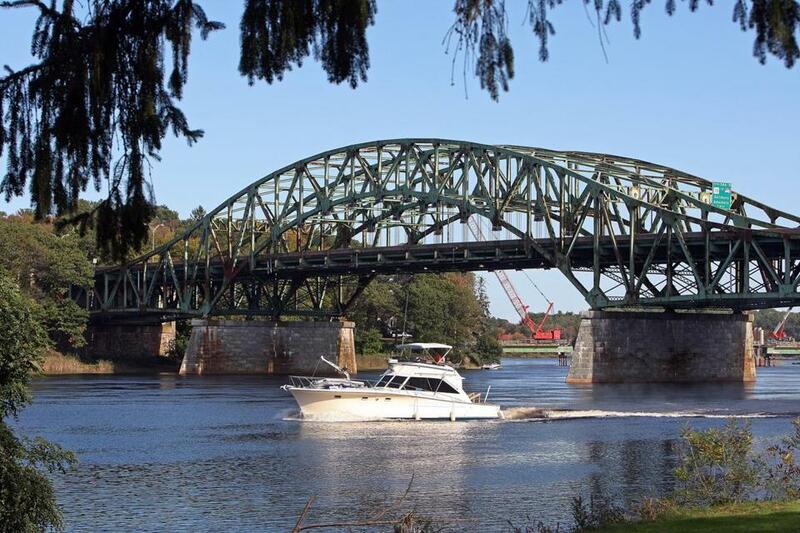 The massive project focuses on the obsolete, deteriorated John Greenleaf Whittier Bridge, built in 1951, which carries about 70,000 vehicles a day over the Merrimack River on six lanes of I-95 between Amesbury and Newburyport. The replacement bridge will consist of two parallel spans, one for northbound traffic and one for southbound, with an increase to four travel lanes in each direction. The new design for the Whittier Memorial Bridge. The northbound side will be built first, next to the old bridge. It will be the wider of the new spans by about 24 feet, so it can carry six lanes of traffic — three in each direction — while the old bridge is demolished and the southbound span built. When both sides are done, the extra space will be a shared-use path for bicyclists and pedestrians. That’s a novelty for an interstate bridge in Massachusetts, and an ardent desire of officials hoping to better connect the three towns. The wider highway and reconfigured ramps also should make for an easier merge with travelers on Interstate 495, which meets I-95 in Salisbury about a mile north of the bridge in an interchange that is often a major sticking point and one that many drivers find intimidating. Under the state Department of Transportation’s accelerated bridge program, the project’s completion is scheduled for the second half of 2016; the lead contractor is a joint venture of Chicago-based Walsh Construction and McCourt Construction of Boston. About 400 workers should be on the job at the project’s peak, said Frank DePaola, administrator of MassDOT’s Highway Division. Already, wide swaths of woods have been leveled alongside the highway, both for the roadway’s new alignment and for access and staging areas for the construction crews. Grading and infrastructure work has started, and the median strip along I-95 north of the river is lined with Jersey barriers in preparation. Work also has begun on piers in the river that will support the northbound span, he said. “In dollar volume and length, this is probably the biggest project of the accelerated bridge program because of the unique challenges . . . besides being over a river the size of the Merrimack, being the major north-south interstate corridor for New England,” he said. The new bridge also will have energy-efficient lighting, possibly including a color-changing LED array similar to the one that has been a popular feature of Boston’s Zakim Bridge, DePaola said. The project also includes widening and realignment of roughly 4 miles of I-95, between just north of Exit 57 in Newburyport and nearly to the New Hampshire line, to improve safety and accommodate the anticipated increase in traffic loads in the future. Plans call for the reconstruction or replacement of eight other highway bridges in that stretch as well. For local authorities, the largest remaining issue is placement and design of a new barrier wall to shield residents of Laurel Road in Newburyport from the sights and sounds of the highway. “We know there are going to be 40,000 more cars using this bridge; we know that it’s closer to residents; we know that they’re adding lanes of highway. So I think they deserve to have a barrier between them and the work site and the future traffic,” said Newburyport Mayor Donna Holaday. Negotiations with state and federal officials are ongoing. A similar issue exists for residents of Rabbit Road in Salisbury. A handful of residents off Main Street in Amesbury also have complained about likely problems from the construction work, including air conditioners filling up with blowing sand and dust. The state has pledged to keep six lanes of I-95 flowing as much as possible during the project. More than 200 people have signed up for weekly e-mail alerts about lane closures and other changes, DePaola said. Electronic message boards and traffic-monitoring systems are or will be in place to keep both drivers and local officials informed, he said. But long before last summer’s groundbreaking for the project, local officials were concerned about traffic nightmares, and they’re not relaxing. “I’m particularly concerned about what’s going to happen next summer as the weather gets better,” said Holaday. Both vacation traffic and construction activity will be at their peak when crews begin the temporary shift of all six lanes from the old Whittier Bridge to the new northbound span. When the Hines Bridge, which carries Amesbury’s Main Street over the Merrimack, was closed by construction for a couple of years, Holaday said, “the overflow traffic that came through on Route 113 into the city was really at times absolutely overwhelming and very difficult. “There is a plan in place during heavy weekend traffic and holiday traffic, that the construction crews get completely out of the way and open up all the lanes to keep traffic flowing,” Kezer said. “There are times they need to get their work done, and that will cause some restrictions, cause some backups,” he said, but plans are in place to address traffic jams. The Greater Newburyport Chamber of Commerce & Industry tries to keep its members informed about the project, but president Ann Ormond said she hasn’t heard that much about it yet.